3·1운동때 일제가 독립운동을 가장 잔인한 방법으로 탄압한 학살현장이다. 3월 10일경에 안종린·안정옥 등이 서울에서 독립선언문과 격문을 입수하고, 3월 25일에 뒷산에 올라가 마을 사람들과 함께 봉화를 올리고 만세를 외쳤다. 그후 4월 5일에 발안장날에 주민들에게 나누어주고, 교회 청년들과 시장에 모인 주민들이 만세를 부르고 시가행진을 하였다. 이에 일본 경찰이 무차별 사격과 매질을 가해 많은 부상자가 발생하였다. 격분한 군중들은 돌을 던져 경찰부장을 죽였다. 4월 15일 일본군은 제암리를 완전히 포위하고 15세 이상의 남자는 모두 교회당으로 모이게 한 후, 출입문과 창문을 밖에서 잠그고 일제히 집중사격을 했다. 또 교회당 밖으로 시체를 끌어다 모아 다시 그 위에 짚을 쌓아 불을 질렀다. 이때 무참히 살해된 주민은 어린이를 포함하여 23명이었다. 일본군은 다시 마을을 다니며 민가에 불을 지르고, 이웃마을 고주리에서는 주민들을 마구 칼로 찔러 죽였다. 이 사건은 죄없는 주민들을 학살한 사건으로 일본이 저지른 잔악행위의 상징적인 사건이다. 1982년 제암리마을의 유일한 생존자인 전동례의 증언으로 이 지역을 발굴 조사하였다. 그 결과 23위의 유해와 희생자들의 조끼단추, 동전, 못, 병들이 함께 출토되어 이곳에 표석을 세우고 합동장례식을 거행하였다. 불탄 예배당터에는 순국기념탑을 세우고, 국·내외 관계자료를 모아 기념관에 전시해 국민 교육의 현장으로 활용하고 있다. It is a representative massacre place where the Japanese colony government oppressed the independence movement on March 1, 1919. On March 10, An Jong-rin and An Jeong-ok obtained a declaration of independence and a manifesto in Seoul, went up to the rear hill on March 25, lit a signal fire, and then held a demonstration. On the Baran Market day on March 5, they made many national flags (Taegeukgi) and distributed them to the people at the entrance of the village on their way to marketplace. Soon, the youth and people gathered there and headed downtown, shouting "independence." The Japanese army fired randomly at people and tortured them; hence the many casualties. The angry people stoned the Captain of the Police Department to death. The Japanese forces laid full siege to the Jeam-ri area on April 15 and gathered boys of 15 and over at the church. As soon as they were assembled in the church, the Japanese soldiers closed all doors and windows and set the church on fire immediately. They then dragged the bodies out to burn on a pile of straw. A total of 23 people including children were slaughtered. The Japanese soldiers roamed around the village and set the houses on fire. They also stabbed innocent people in Goju-ri to death. The massacre of innocent people was the peak of the cruelty committed during the 36-year colonization. 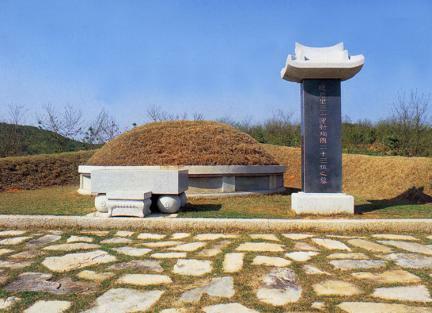 After the exhumation by the testimony of widow Jeon Dong-rye as the sole survivor of this massacre, the bodies of 23 people, buttons of clothes, coins, nails, bottles, etc., were discovered; they then built a tomb stone on this place to perform a memorial ceremony. 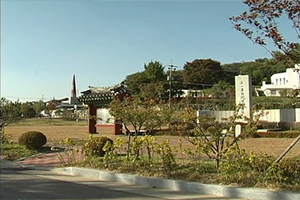 People buried them in the same spot, set up the monument of sacrifice, and collected related materials nationwide and overseas to exhibit in the memorial hall and use for education.